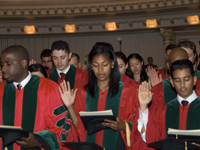 The Weill Cornell Class of 2007 take the Hippocratic Oath during Commencement at Carnegie Hall, May 30. Backstage, students were abuzz with excitement. 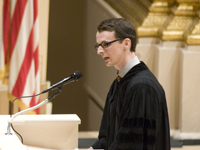 Click here for a slideshow of Commencement 2007. 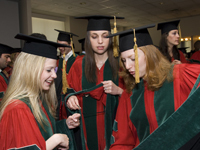 Weill Cornell Medical College and Weill Cornell Graduate School of Medical Sciences held commencement exercises at Carnegie Hall on Wednesday, May 30. The graduating class included 12 M.S. degrees, 49 Ph.D. and 95 M.D. degrees. The ceremonies were presided by Dr. Charles Walcott, dean of the Cornell University Faculty; Dr. Antonio M. Gotto Jr., dean of Weill Cornell Medical College; Cornell President Dr. David J. Skorton; and macebearer Dr. E. Darracott Vaughan Jr., preceded by an invocation by Rabbi Mark Popovsky. 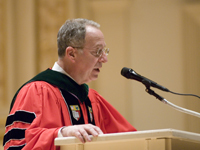 Dr. Skorton, in addition to his role as president of Cornell University, is a cardiologist, researcher and musician. "This is a thrilling time to be entering science and medicine," he said in his address to the Class of 2007, referring to advances in genetics and biomedical research. "You are among the most qualified medical scientists in the world." 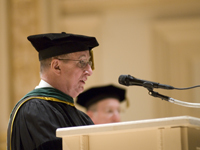 Dr. Skorton encouraged the graduating class to think not only of national health issuesciting disparities like racial gaps in life expectancy, infant mortality, certain cancers, and the skyrocketing cost of health-care coveragebut of global health crises as well. 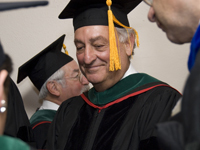 He referred to the collaborative work between Cornell and other institutions, such as HIV and syphilis treatment programs in Haiti and the establishment of a medical center in Tanzania, at which several of the graduating students had worked in recent years helping to treat malaria and tuberculosis, as one way the new doctors can put their knowledge to use. "You have the capacity to change individual lives and society," Dr. Skorton told them, "both in the United States and around the world." Dean Gotto echoed Dr. Skorton's comments. "You are there to serve the patient," he said, "and your patient could be the person next door or the person from halfway around the world who needs your help." Dr. David P. Hajjar, dean of Weill Cornell Graduate School of Medical Sciences, introduced student speaker Peter Jordan, who urged his classmates to take with them three important lessons. "First, we must always do justice to the facts," Jordan said. "My second point is that all of our master narratives and scientific theories are provisional; be flexible enough to accommodate new discoveries." And thirdly, "Always be wary of people with agendas, both inside and outside of science." His theme to the graduating class was to check their egos at the door and to keep their new pedigrees from leading them to the age-old flaw of hubris. "We must be aware of our intellectual blind spots," he said. Terry Magnuson, Ph.D. '78, received the Graduate School of Medical Sciences Alumni Award, presented by Dr. Francesca Domenech Wuttke. "My time here was exceptional. It set the tone for the rest of my career," said Dr. Magnuson, a leader in genetics and developmental biology. "You are entering your fields at an exciting time," he said. "You now have the tools. Next you need the imagination." 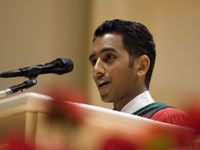 As Medical College student speaker, Anuj Mehta brought an air of levity to the occasion. "Most people who know me know that I talk a lot," he said to knowing laughter from his classmates. An adept and lively speaker, Mehta compared the medical profession to a "Where's Waldo" poster. "One must peel away the distractions," he saidreferring to regulatory issues, malpractice concerns and increasing public fears of physician-pharaceutical fraudto find that the nobility of medicine is still there. "The very nature of doctor-patient relationships is older than even Hippocrates," he said. "I think that's where the nobility comes fromwe all have an equal stake in what we do there. When both doctor and patient are placed in the same room," he concluded, "something greater is created." The final speaker was internationally recognized heart specialist Jay N. Cohn, M.D. '56, who was given the Medical College Alumni Award. "When I was a medical student, we operated on the principle that half of what we learned was wrong, but we didn't know which half," he said to a round of laughter. "I suspect that is still true!" Dr. Cohn stressed his message in more serious terms: "Don't just accept what you've been taught, but pursue medicine with a thirst for new knowledge. The establishment can tell you what to do, but not what to think." Written by Jeffrey Stanley. Photography by Amelia Panico.